Panda's are generally docile creatures that one wouldn't assign to guard duty. However, Panda Security has concluded that by not appearing threatening an antivirus program can jump easier at an unsuspecting malware's throat. In this regard it has trained thousands of digital pandas for the task of protecting tablets all over the world. Panda Security & Antivirus comes with a couple of neat little features that can really shed some light over what apps are actually doing down there. The Privacy Auditor is a well-spoken bloke that lists your Android's access permits and shows all relevant apps underneath each of them… in a polite manner. The task killer is a side effect of a trained to kill panda bear. 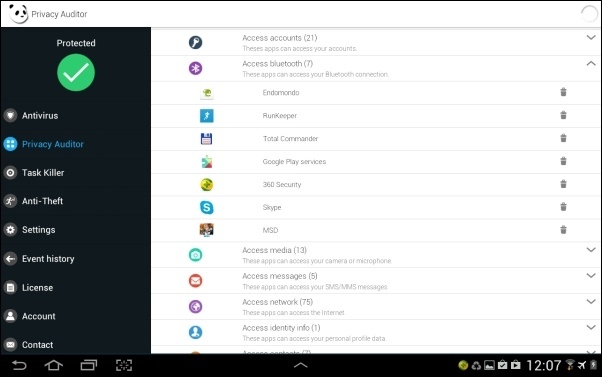 It lists all your apps showing how much space they occupy and how much memory they are using up. There you may decide upon which you want to unleash the bear. Panda Security & Antivirus also comes with an antitheft option and (of course) an antivirus feature. Among scanning individual applications, users can order quick and full scans, depending on their preferred level of thoroughness and time constraints. Speaking of which, time constraints is generally an important factor when deciding which antivirus software to install for your tablet or phone. If you generally can't wait for those scan results to come back, then Panda is likely to test your patience. Scans are a tad slower than with other similar apps. In truth, pandas cannot run that fast so it should not have come as a surprise. The antitheft tools are somewhat limited. 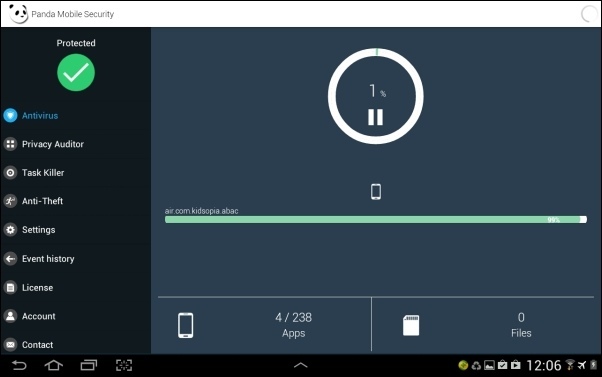 A screen shows the device location while the only possible actions are device lock and data wipe. The scans are pretty accurate. Panda Security does the job well. The Privacy Auditor is extremely useful for reviewing your installed applications. Scans take time and may slow down other demanding apps. Panda Security & Antivirus doesn't have a lot of features but the ones it does have are useful and effective. Considering it is also discreet when it comes to notifications, Panda might be a good choice if you decide that it is worth the price.